Digital Underground all started around keyboardist, DJ, bass player and MC Shock G. A native of Tampa, that had lived in Brooklyn, Queens, Los Angeles before settling down in Oakland. Chopmaster J a music equipment store employee and DJ took Shock’s song Underwater Rimes which at the time was a #1 hit in Amsterdam. This did not net them any money but it did get them in the door. Their style was constantly evolving. On the flip to Underwater Rimes was Your Life’s a Cartoon where they were on some black beret wearing Black Panther ish but then they saw Public Enemy did that better than anybody. When Underwater Rimes hit they were a hippie oriented band that decided against that after seeing De La Soul they decided against that. “Everything we did somebody was doing better than us!” according to Shock G so then they settled on some Parliament/Funkadelic ish where they just decided to do all different kinds of songs and wore different hats all the time. Their humorous element caught the attention of Tommy Boy in New York. They wondered if D.U. had anything else like Underwater Rimes so the first song they recorded was Doowhutchalike. Initially it was Shock G doing everything but he had sold Tommy Boy a full-fledged group so he needed to hire some folks. Shock said up until that time when he thought of what the group needed he just became that dude. He auditioned local DJ’s so Fuze was added from that. Money B was already in a group called Raw Fusion with Fuze so he was easy to bring aboard. Money B used to rhyme with a dude called Mac Mone in a group called MGM so they put him on. Shock’s old roommate Schmoovy Schmoov was added. The last person added was closer to Shock G than anyone. It’s universally known that Shock G was Humpty Hump was Shock G but Shock did all he could back in the day to convince every one of otherwise including having body doubles on stage at times and in the beginning there were 3 different opinions. Either you believed it, knew better, or didn’t care. Shock kept it going because of something that George Clinton said that served as the inspiration for Humpty Hump. “Characters live longer than human beings do. They don’t burn out as quickly” Shock G saw to it when they created Humpty’s theme song and dance. 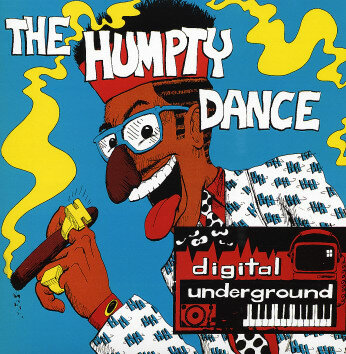 Humpty wasn’t a master plan from Shock G but it just kind of evolved. When they were editing the Doowhutchalike video Shock saw the power of Humpty Hump and he felt that doing Humpty was like doing ventriloquism. He started the myth of Humpty Hump on a college radio show. Humpty was Shock’s brother from Tampa. He was a former lounge singer that had been in a grease accident in a kitchen thus explaining the nose. He stood as a hero to handicapped people everywhere that no matter what, you could do anything. To Shock’s surprise people bought into it. Money B and his brother contributed to the dance and according to Money B it was a well thought out plan. There had been a huge earthquake around that time in San Francisco and that influenced the dance as well. It kinda looked like you were bracing yourself for an earthquake. The song was recorded after the album was done. They had done about four or 5 takes but none sounded as good as the first. They couldn’t figure out what was missing but Money B was on the case. They ran to the store, got Shock some Hennessy, Humpty came out and a classic was born. When they sent the song to the Tommy Boy offices to add to the album Shock called up Monica Lynch who was running Tommy Boy at the time, George Clinton was sitting in the office discussing clearing (Not Just) Knee Deep for De La Soul to use for Me, Myself, and I. Monica put Shock on the phone with the godfather of funk, and at first Shock didn’t believe him. When he did finally realize it WAS George Clinton he was speechless! George Clinton did the talking and told Shock he thought “The Humpty Dance” was cool. Shock knew he was on the right track then. A platinum single later it’s hard to say that Shock G, Humpty Hump, and George Clinton were wrong. Enjoy. ~ by Professor Mike on June 25, 2010. Just to set the record straight Chopmaster J wasn’t the music store employee, Shock G was as they recorded Underwater Rhymes on Chopmaster J’s recording equipment he purchased from Shock who was working at Music Unlimited at the time! If I am wrong, I would rather be corrected than be led to believe that I am right. Thank you for your education, Mr Dright.